A property popped up on Heather's radar about a month ago. While on a business trip in the area, she took the opportunity to request an early evening viewing. Even as the sun set behind the hills, and even though she was exhausted from a long day of work, it really resonated. My phone blew up with text after text describing the house, community and neighbourhood. We looked at about six different properties that day. Our realtor and new friend Rob picked up on the essence of what we were shooting for and after we spent quality time viewing the various homes he would ask: "Is this is your next 20 years house?" Heather and I looked at each other and said "No!" in unison. There was one notable exception, and that was the property that drew us down in the first place. 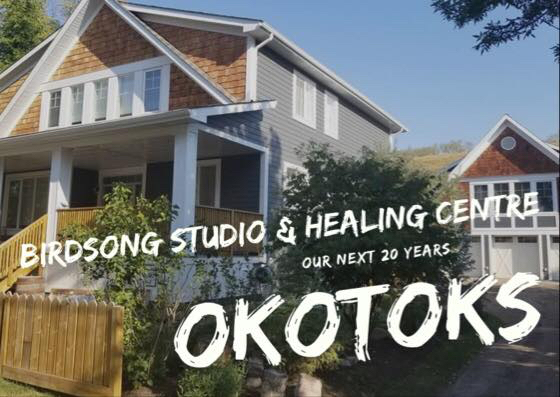 We are excited to share that BIRDSONG STUDIO AND HEALING CENTRE will be relocating to historic Elma Street in Okotoks. We are so grateful to the family and builder that put so much love into this property. Even though it is a new build, it was designed to fit beautifully into the neighbourhood. There are historic homes all down this amazing street with boutique coffee shops, an architecture firm, a doctor's office, and an art gallery. One block away is an old church that has been repurposed as a performing arts space. A sign for me, right off the top, was the little library box located right in front of the house. The deer wandering around the neighbourhood also set the right tone, as did the birds singing in the mature trees. I'm excited for Heather, as she will have a beautiful treatment space to work with her clients. It is bathed in light and easily accessible to the left of the front door. She'll also have plenty of room to be creative with courses and offerings for groups of people. I'm excited to have double the amount of space for Birdsong Studio. I've been saying for quite some time...."if I only had 6 more feet". Well, now I will have 12. I will also have a sink for washing brushes. How awesome is that? Moves like this are hardest on the kids. It was an emotional conversation with Ben as we shared with him that we had made an offer. While Dylan has moved away to National Theatre School in Montreal, it was equally hard sharing the news with him. They are both adjusting and being brave. Ben will have a larger room, and plenty of space to set up his guitars and computer station with a massive north facing window. There will also be plenty of room when Dylan visits. The location is super important for our next 20 years. Okotoks is closer to Heather's mom and dad. It is very close to her brother and family. 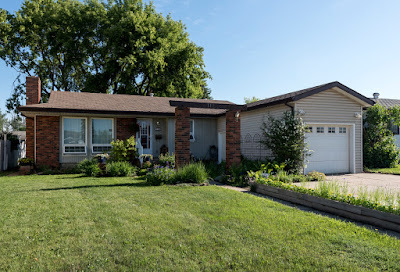 It is 45 minutes from the Calgary airport, which makes it super easy for us to go places and for others to come to us. It is an hour from the mountains and 15 minutes to south Calgary. One of the concepts that put me over the top about this being our next 20 years home was the idea of offering an artist's retreat. Above the studio is a beautiful carriage house apartment, with a full kitchen. I love the idea of sharing my creative space with others. Fort McMurray has been home for a very long time. It has been a great place to raise a family and grow as a human being. It will be incredibly hard to leave this home in late June. I'm trying hard not to think about that too much. Instead, I'll slowly start packing and focus on getting the house and yard ready to pass along to the next family. A whack of McMurrayites relocating to Okotoks area. You will no doubt bump into them at the grocery store. Good luck in your next 20 years in Okotoks. After that? Perhaps Nanton as you head further south.